A myriad of groom's cake ideas make this quaint Southern tradition a fun task. The groom's cake should reflect his personality, hobbies, and interests. In the flurry of bridal events and decisions, the details of the groom's cake should fall squarely on the shoulders of the husband-to-be. There are many appropriate and fun ideas to guide the groom in choosing the theme, color, size, and flavor of his special cake. 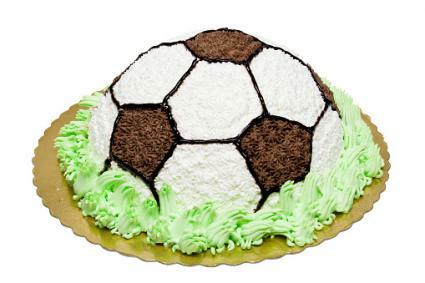 A cake shaped like a particular sports ball, field, team logo, or decorated in team colors can clearly show the groom's allegiances. Career: A groom with a prominent career may appreciate a cake to reflect his hard work and achievements. 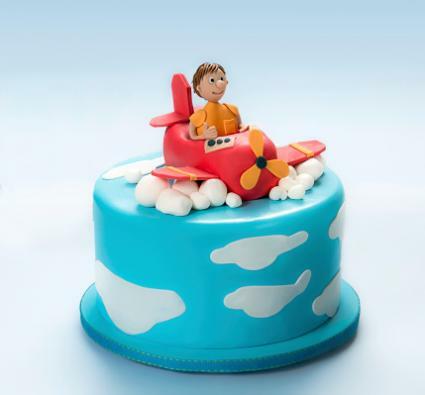 A caduceus for a doctor, computer for a software designer, shield for a police officer, fire truck for a fireman, or wings for a pilot are only a few career-oriented groom's cake ideas. Alumni: If the groom has not yet established his career but is proud of his educational achievements, a cake to highlight his alumni status would be entirely appropriate. The school colors, mascot, or logo are all fun options. Home: A groom's cake to illustrate the groom's origins is a fun way to involve his individuality in the celebration, particularly if he is now far from home. 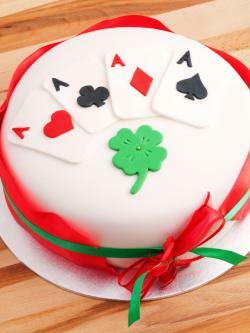 A cake shaped like his home state or using a symbol of his home - a landmark or logo, for example - can make the cake unique and meaningful. Hobbies: Emphasizing a hobby is a great way to create an individualized groom's cake, particularly if the hobby is one that initially brought the couple together. Sports, photography, travel, home repair, pets, and poker are just a few options. Food: Using the cake to mimic the groom's favorite food is a fun way to make a quirky statement, and can be even more sentimental if that food is one the couple shared on a first date or the night he proposed. 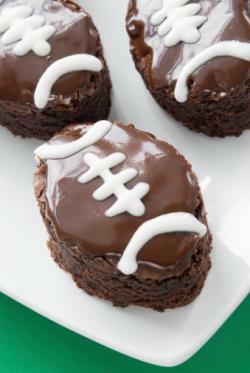 Cakes can be shaped and decorated like burgers, pizza, or even more unique dishes. Personal Information: A more subtle personalization that can be elegantly integrated into a groom's cake is to emblazon it with his initials, birth date, and other pertinent information, such as nicknames, favorite movie or book titles, role models, schools, hobbies, and other details drawn in icing. This can be a simple yet very meaningful way to decorate a unique groom's cake, as long as no embarrassing details are used. There is more to the groom's cake than just the idea behind it, however. The cake's size, flavor, and display are equally important to highlight the personality of this central wedding figure. Just like with the wedding cake, the groom's cake should be large enough to feed most of the attending guests (many guests may prefer one cake over another, but may want to sample a piece of each out of politeness or curiosity). Of course, if the groom's cake is presented at the wedding rehearsal dinner, bachelor party, or other event instead of the actual wedding reception, it can obviously be smaller to accommodate the smaller number of attendees. Unlike the wedding cake, however, the groom's cake is usually not tiered, though certain design elements may need additional height. Therefore, it is more likely that the groom's cake will be a less expensive sheet cake rather than a more elaborate designer cake. The flavor of the groom's cake is just as important as its design. Chocolate groom's cakes are popular options, as are other unique flavors such as rich fruit-based cakes, liqueur-soaked cakes, candy cakes, brownies, or any flavor the groom prefers. Typically the groom's cake is richer than the wedding cake, which must take into consideration the taste preferences of the entire guest list. If it is presented at the wedding, the groom's cake is usually displayed near the wedding cake but not typically on the same table. If the wedding cake is to be unveiled at a certain point in the festivities, the groom's cake is usually on display throughout the evening for guests to enjoy, and it may be cut before the wedding cake or near the garter toss (only the groom cuts this cake). The cake table that holds the groom's cake may also feature other items special to the groom, such as pictures, mementos, and memorabilia to highlight his personality. Despite the wide range of groom's cake ideas, some couples prefer not to indulge in this tradition and instead find other ways to incorporate the groom's tastes and individuality into the wedding. Choosing different flavors for the various tiers of the wedding cake is one way to give both the bride and the groom a say in that luxurious dessert, or the groom may choose alternative desserts - cookies, brownies, chocolates, tarts, etc. - to be served as wedding cake alternatives. The groom's cake is a fun wedding tradition that brings honor and distinction to the soon-to-be husband by letting his tastes and preference take center stage. By choosing a design, flavor, and display that complements the groom, the couple is sure to use groom's cake ideas to create an event honoring both members of the newlywed couple.